Mr FARID AHMAD is currently the Director of Marketing and Business Development of Companies Commission of Malaysia (SSM). His job primarily is to generate revenue for SSM through sale of information in view of the self-funding nature of SSM, product development, overall operations and continuous improvement of the SSM customer service delivery. SSM Registry System i.e implementation of a new system to replace the existing SSM Core system. This project includes modules such as name search, name reservation, incorporation, particular updates and insolvency of a company to name a few. The project is now at 21 percent completion and expect to go live in June 2019. He is also an alternate project director for SSM Enterprise Resource Planning (ERP). ERP is a system and software packages used to manage day-to-day business activities. This project is expected to roll out in October 2018. 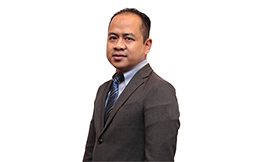 He possesses a Bachelor of Business Administration (BBA) from Universiti Putra Malaysia (UPM) majoring in Human Resource Management and Master of Business Administration from University of Malaya and has been working for SSM for the last 11 years. More and more projects, and solutions, right around the world are leveraging the benefits of standardisation combined with tight connections to core business systems. What are the benefits to these end-to-end solutions?